Saving money at the Grocery Store has never been this easy! How many times do you go to the store and find that 75% of the things you buy for dinner that week are on sale, without ever having even looked at the sales flyer or for coupons? Never, right? Well, for our lucky members who choose to shop at Harris Teeter in the southeastern US this week, (and for the past two weeks!) that’s exactly what they’ll find. Our unique technology that creates delicious, easy-to-prepare weekly menus that optimize use of store sales hit the jackpot this week! 75% of the 34 ingredients for the five dinners are on sale! 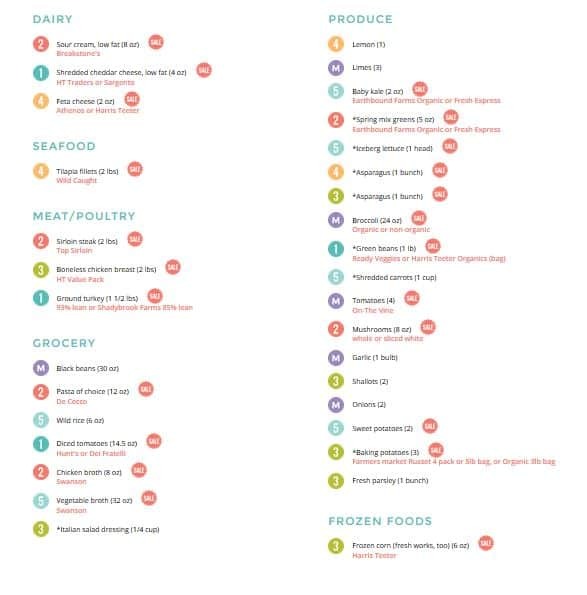 Take a look at the shopping list image to see for yourself. – we mark all the sale items clearly. We’ve also posted a link below to both the Weekly Menu and the Shopping List, so if you live near a Harris Teeter and want to try it out for yourself, please do! We of course don’t guarantee that this many things will be on sale every week, but its not unusual in many stores to find 40-50% or more of the items on sale. Our research shows that many of our members will save over $1000 or more each year on food costs using The Dinner Daily. If you want to optimize use of your store sales, but don’t want the hassle of leafing through the flyer and finding recipes to use those things, let us do it for you! For as little as $1 a week, it may be the smartest investment you make! Best wishes for a wonderful 2017 to all of you! Here are the links to the menu and shopping list for the Harris Teeter sales cycle 1-25 to 1-31 2017. They are a little blurry, sorry! Our members view these on their dashboards, where they are clear, they are interactive and you can change or delete any main or sides in minutes using our Switch It feature.